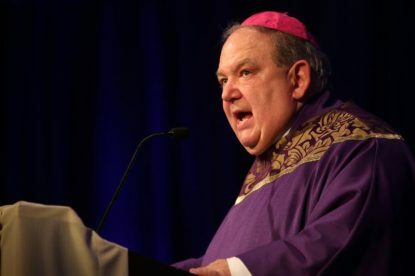 BALTIMORE (CNS) — Dressed in penitential purple vestments, Cardinal Daniel N. DiNardo of Galveston-Houston, president of the U.S. Conference of Catholic Bishops, led the bishops of the United States in a Mass Nov. 12 to open their fall general assembly in Baltimore. St. Josaphat “was put to death for his steadfast commitment to church unity,” the archbishop said. Archbishop Hebda said he was pleased that Pitt Green and Torres were able to talk about some of the good that has come about in the church since the bishops passed the “Charter for the Protection of Children and Young People” in 2002, whether in the form of protection of children or in victim assistance. If they find the work ahead difficult, they should keep in their mind the image of Pitt Green and Torres and other victim-survivors who have shared their experiences with the bishops in the course of their pastoral work — “the sheep for whom we, out of love, need to lay down our lives,” Archbishop Hebda said.